This black midi is one of my favorite skirts ever. I have the exact same one in Red which was just perfect for our Christmas Cards last year. It's the girliest-most over the top style that I just love. Speaking of turtle-necks...I seriously don't know what to wear them with. This is the softest comfiest sweater, but I feel like it needs to be balanced with something super feminine like a poofy skirt and sparkly necklace to work with my style. We've been living in Arctic Tundra all week, so i'm hoping for a slight warm-up this weekend. This winter body needs some sun. And maybe a Zumba class or two while i'm at it! Hope you ladies have the most amazing weekend! If you like this look, you can shop it below. you look very pretty with this skirt and i also like how you put your hair up, very feminine! Thank you, Alice! A messy bun is my favorite way to go. I have a skirt that is super similar (from eshakti) and I LOVE it! I haven't worn it with a turtle neck yet, but it is amazing with chambray or even a v-neck sweater tucked in. oooh a good chambray shirt would be PERFECT underneath! Good call, Trac! Thank you my pretty friend! Thank you, Maria! You're always such a sweetheart. Thank you, Laura! It's one of my favorites. xo! So easy to throw together, right? Thank you so much for coming by, Vale! What a fun midi skirt! I'm so obsessed with midi's this year! Oh my gosh, isn't it perfect?! I could bare to send it back in my rocks box! Like I said on Insta... You are the queen of the high bun! :) You look insanely gorgeous with it! :) This look is so classy! Love it so much on you!! It's only cause there is just so much hair to go up in it! ;) I love you, Erin! You always know how to brighten my day! A big skirt is just the best! Hope you've had a great week, Zarrah! You're the cutest! 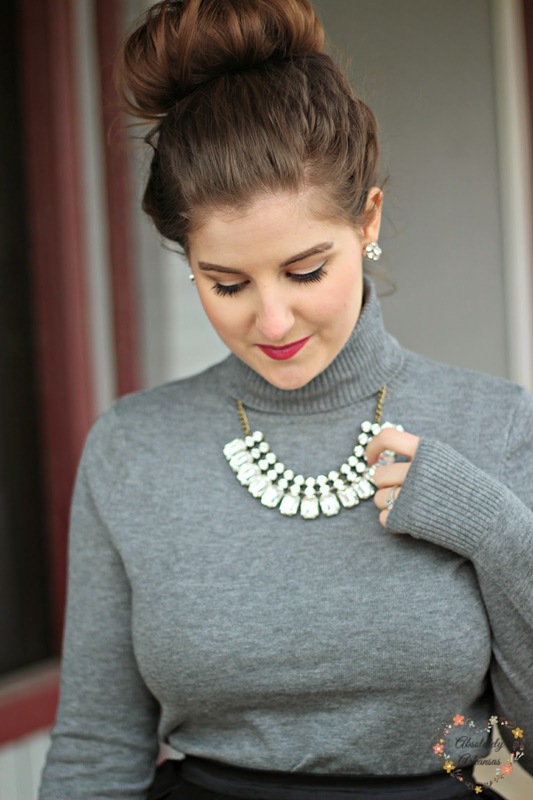 Love the black midi and grey turtleneck combo! This is so feminine and pretty! Love the black midi, it seems so classic, yet trendy at the same time. Thank you, Danielle! Hope you're having a great week. xo! You look amazing! 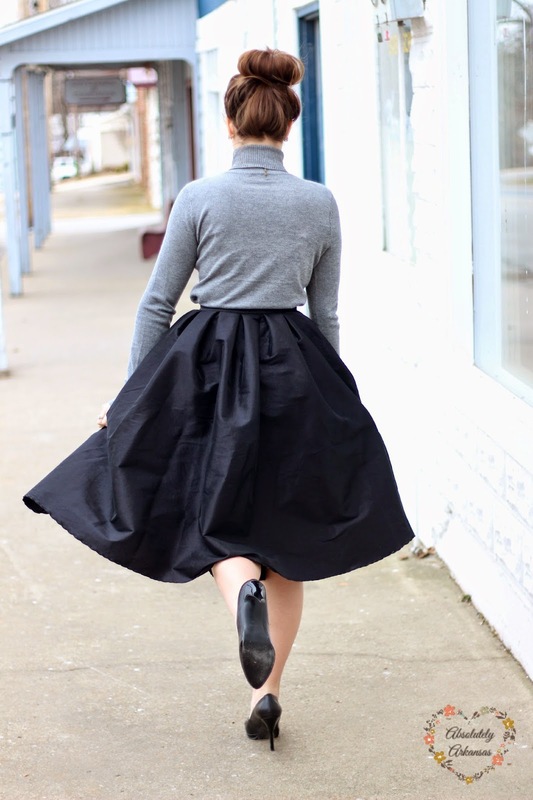 I'm obsessed with this chic combo, that skirt is so pretty and twirl-worthy! !